PG-13 for sexual references, drug content, language and some horror images. 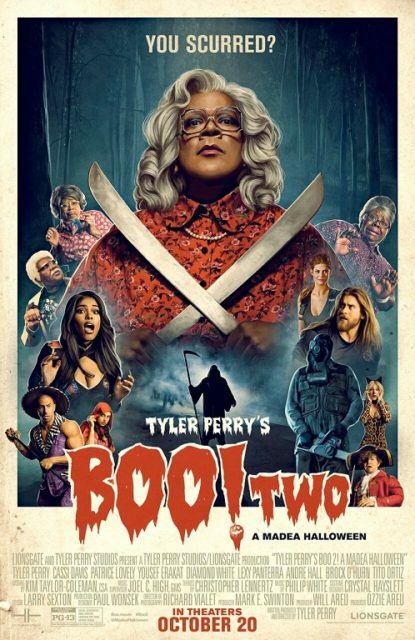 Check out the trailer for Boo 2! A Madea Halloween. One lucky reader will win a Boo 2! 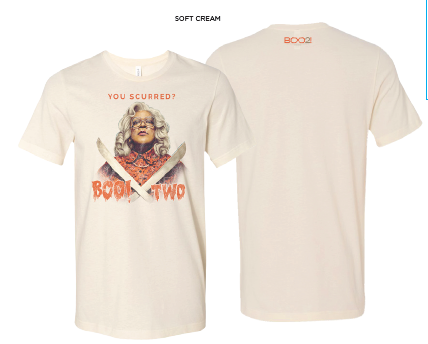 T-shirt (random sizing) and a Boo 2! Stencil Kit. This giveaway is US only and ends on Wednesday October 25th. Disclaimer: temppatt was compensated for this post. I’m not associated with any of the companies named above. No purchase is necessary to enter. Void where prohibited by law. The odds of winning are based on the number of entries received. Confirmed Winner(s) (by Random.org) will be contacted by email. Winner(s) have 48 hours to respond before a new winner is chosen. The sponsor(s) will be responsible for product shipment to winner(s) of this giveaway. My blog is not responsible for product shipment/delivery. This event is in no way administered, sponsored, or endorsed by, or associated with, Facebook and/or Twitter, Google, Pinterest. This disclosure is done in accordance with the Federal Trade Commission 10 CFR, Part 255 Guides Concerning the Use of Endorsements and Testimonials in Advertising. I dressed as an old man when I was a 22 year old girl. I even scared myself when I looked in the mirror. The year I was a pumpkin. looked a little strange but I wore a leaf bag. I was a pumpkin one year. My mom made the costume. I love to be a witch, thank you so much! I like dressing as a Child Zombie. My favorite was last year when I dressed as an angel and my husband dressed as a devil! Perfect for us! My favorite costume was a Wind Up doll. I loved to dress as a Zombie HoBo. It was fun to drag my feet & scare everyone. I like the Santa I was one year, and a hit with kids. I dressed up as Elvira once! It was tons of fun! My favorite costume was my Hawkeye costume! Sheet-with-eyeholes-ghost. It’s dead easy and such a cliche that it’s ironically funny. My favorite was a banana many years ago. When I was in grade school, my mom made me a pink power ranger costume. That’s my favorite. Last year I was a contestant from the Price is Right! My favorite costume has been Sally from The Nightmare Before Christmas! I was a Queen of Hearts playing card in elementary school…I made the costume myself. As a kid I liked dressing up as Dracula. My favorite is the Raggedy Ann costume I had when I was little ! We dressed as Zombie’s one year and had a lot of fun doing it. I always loved dressing As a witch, I was the good witch when I was 16, that was probably my favorite costume. My favorite was when I dressed as Pocahontas.